The U.S.-backed Syrian Democratic Forces launched an attack over the weekend to capture the final territory in Syria under Islamic State control. 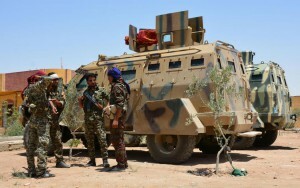 On Saturday, the SDF renewed its efforts to capture the village of Baghouz Al-Fawqani in Syria’s eastern Deir Ezzor province after putting it on hold for a week as more than 20,000 civilians were evacuated from the area. The U.S.-led coalition launched airstrikes on the village where at least 500 fighters are believed to remain, as some are believed to have burrowed underground and traveling through a network of tunnels that allow them to move between houses without being detected. Last week the Senate passed a Middle East policy bill including a rebuke of Trump’s plan to withdraw U.S. troops from Syria and Afghanistan.